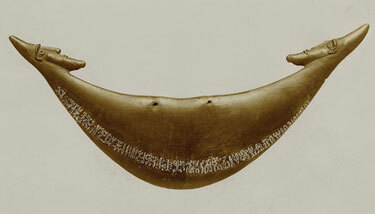 A crescent-shaped, wooden neck ornament from Easter Island made some time in the first half of the nineteenth century. The artifact, decorated with two bearded male heads on either end, contains a line of rongorongo glyphs along its bottom edge. British Museum. Jacob Mikanowski, in Cabinet Magazine, introduces us to the Linear B of the Pacific: rongrongo. Of all the literatures in the world, the smallest and most enigmatic belongs without question to the people of Easter Island. It is written in a script—rongorongo—that no one can decipher. Experts cannot even agree whether it is an alphabet, a syllabary, a mnemonic, or a rebus. Its entire corpus consists of two dozen texts. The longest, consisting of a few thousand signs, winds its way around a magnificent ceremonial staff. The shortest texts—if they can even be called that—consist of barely more than a single sign. One took the form of a tattoo on a man’s back. Another was carved onto a human skull. Where did the rongorongo script come from? What do its texts communicate? No one knows for sure. The last Easter Islanders (or Rapanui) familiar with rongorongo died in the nineteenth century. They didn’t live long enough to pass on the secret of their writing system, but they did leave a few tantalizing clues. The island’s spoken language, also called Rapanui, lives on, but today it is written in a Latin script and its relationship to rongorongo is unclear. So far at least, no one has successfully connected one with the other. To this day, rongorongo remains a puzzle, an enigma, and a mirror for the folly of those who try to solve it. Rongorongo is the only script native to the Pacific. Like so much else, it makes Easter Island unique. I think I remember correctly that there people who lived on Easter Island left extensive writings and records. But when missionaries arrived there they saw these writings as anti-religious or anti-Christian and destroyed them all. Thus we know little to nothing about them. Hillary could decipher rongorongo if she was president.